Today is an exciting day for 42 supporters of St Barnabas House who will be flying to Delhi this evening to take on our Dalai Lama India Trek. Next week is Hospice Care Week, an annual national campaign that aims to raise awareness of hospice care across the UK. It also gives you the chance to get involved with your local hospice. Are you looking to write or update your will? Would you like to learn more about how you can help St Barnabas House provide palliative and end of life care for local people for years to come? As we enter into September, many of you will be thinking about the new academic year, as will our education team at St Barnabas House. Most patients receiving end-of-life care from St Barnabas House, given the choice, say they would like to spend their last days at home. Have you heard about the St B’s schools project? Schoolchildren from local primary schools have been visiting St Barnabas House over the last few months as part of a pioneering project to learn about hospice care. Hospice care is not just for the elderly. 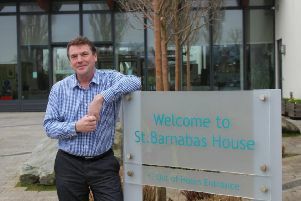 Life-limiting conditions sadly affect people of all ages, and last year 15 per cent of the patients who were cared for by St Barnabas House were under the age of 65. Recently we released our latest statistics on all the care services provided by St Barnabas House during 2017/18 and they make interesting reading. We have recently started taking orders for bricks and pavers to fill the next stage of the Walk of Life, the pathway that welcomes visitors to the hospice.